Lama Acharya Gursam Rinpoche will be visiting the Florida Drikung Dzogchen Community September 18-20, 2009. On Friday September 18th at 7PM, Lama Gursam will teach on "The Mantra of Compassion, OM MANI PADME HUNG". On Saturday September 19th from 10AM-12PM and 2PM-5PM, Lama Gursam will teach on "Calming the Body and Mind: Vipassana Meditation". On Sunday September 20th at 10AM, Lama Gursam will offer the empowerment of the Medicine Buddha. In the afternoon, at 2PM-5PM, Lama Gursam will give teachings on the practice of Medicine Buddha. All sessions are offered on a donation basis. Nobody is turned away because of money. Suggested donation $20/session and $30 for the Medicine Buddha Empowerment. Please preregister by email. All teachings are at 1103 Hays Street, Tallahassee, FL, 32301. At the age of six, Lama Gursam entered Drikung Kagyu Monastery in Tso Pema, India, where he completed his basic education and studied Buddhist philosophy, practice, ritual and conduct. In 1981 he began his college education at the Central Institute of Higher Tibetan Studies (University) in Sarnath, Varnasi, India. He earned his Bachelor's degree in 1988 in the Sanskrit, Hindi, Tibetan, and English languages and in Buddhist philosophy. Pursuing graduate study at the University, he was President of the student union, and served two years as a Kagyu Committee member. In 1990 he received his Master's degree in advanced Buddhist philosophy. Upon graduation he also received a special award from His Holiness the Dalai Lama. 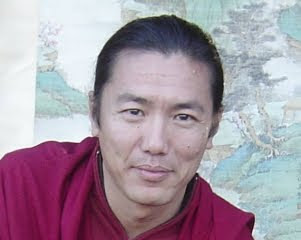 After graduation, Lama Gursam was requested by His Holiness Kyabgon Chetsang Rinpoche to come to the Drikung Kagyu Institute in Dehra Dun, India, at a critical time where there was a great lack of teachers and funding for education. There he served as a volunteer for five years, teaching Tibetan language and Buddhist philosophy and history. He also held the posts of Instructor, Head of Examinations, and Assistant Director while serving as secretary to His Holiness Kyabgon Chetsang Rinpoche, the head of the Drikung Kagyu lineage of Tibetan Buddhism. During this time, he also did a one-year meditation retreat and received Dzogchen teachings and empowerments from Khenchen Thupten Rinpoche and other lamas of the Nyingma lineage. He also studied with Dr. Pema Gyaltsen, a specialist in the Tibetan language. In 1995, Lama Gursam was sent by His Holiness Kyabgon Chetsang Rinpoche to the United States, where he taught Buddhist philosophy for five years. Lama Gursam worked as a resident teacher in a Tibetan Meditation Center, also serving as director of North American Drikung Kagyu Center. Then Lama Gursam met His Eminence Garchen Rinpoche, whom he considers to be the second Milarepa. Under H.E. Garchen Rinpoche's guidance, together with the Venerable Traga Rinpoche, he became a yogi, and in 2002 he completed a traditional three-year retreat in the United States, practicing Mahamudra and the Six Yogas of Naropa. After a nationwide teaching tour, he then traveled to India, Nepal and the border of Tibet, where he completed a six-month retreat in Milarepa's cave at Lapchi. Lama Gursam continues to return every year to India for teachings and retreats, and every year to the United States and Canada to reunite with friends and students for teachings. His current sanghas are located in Vermont, Maryland, Pennsylvania, North Carolina, Virginia, and Arizona, as well as Montreal and Sault Sainte Marie, Canada. Additionally, every 2-3 years, Lama Gursam leads a pilgrimage to Buddhist holy places in India and Nepal. In 2006, Lama Gursam founded The Bodhichitta Foundation, a U.S. non-profit organization officially recognized by His Holiness Chetsang Rinpoche, head of the Drikung Kagyu lineage. The Bodhichitta Foundation benefits the West with teachings, a future center and retreat land, and the East, preserving ancient texts, Tibetan culture, education, women's rights, and health.